Who hasn’t experienced overwhelming frustration, sadness, or confusion? Who hasn’t used anger to block those difficult feelings? 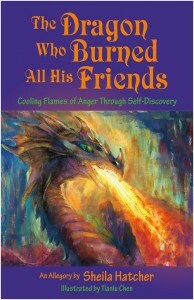 “The Dragon Who Burned All His Friends” is an inspiring and entertaining way to learn how to deal with difficult feelings without resorting to anger. Join Ashton Mondragon as he meets Frank the fireman and decides to begin flame-control training after another disastrous day with his family and friends. As Ashton learns about his flame and the importance of thoughtfulness in relationships, adult readers will learn anger management techniques and ways of self-reflection that can lead to lasting change.